The theme of partition inspired many writers, mostly prose writers. Among them Saadat Manto stands out as the one who contributed the largest number of writings on this theme. In Urdu literature there are few poems on the subject which include Faiz's Subh-e-Azaadi and Qasmi's Phir Achanak Teergi Mein Aa Gae. It goes to the credit of Ahmad Rahi that he wrote highly inspiring poems on the subject in Punjabi. One can also mention the famous poem by Amrita Preetam in which she addresses Waris Shah to wake up and see the plight of the blood-bathed Punjab. That poem became a classic. 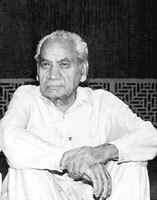 Ahmad Rahi, who began as a promising Urdu poet and edited Savera, the journal of progressive writers, wrote his first Punjabi poem which was rendered as a song in one of the eraliest Pakistani films, Beli. Written by Saadat Hasan Manto and directed by Masud Parvez on the theme of partition, the film flopped at the box office. It depicted the sorrowful plight of a girl kidnapped during the riots in East Punjab. When she was recovered by special recovery force and brought to Pakistan, her parents refused to accept her. Based on a true story, the film could not be properly filmed due to the lack of technical facilities in Lahore's only studio. It was sometimes in 1952 that Ahmad Rahi's first book of Punjabi poetry appeared under the title of Trinjan. The book left the literary circles flabbergasted by its pathos and diction reminiscent of Punjab's folk tradition. It directly touched the sensibility of the reader. The book brought into focus the old question of whether the Punjabi language could produce literature to match other languages, specially Urdu literature. Today the situation is different when much work has been done on unearthing the hidden treasures of Punjabi literature and a whole lot of Punjabi writers have started seriously writing in Punjabi. In the early 1950s, it was a pioneering effort by Ahmad Rahi and the work he produced stands out as a landmark in Punjabi literature. One wonders why Rahi, who had made a name in Urdu poetry, chose to switch over to Punjabi and produce Trinjan. Perhaps Punjabi was much nearer to the sensibility of Rahi because during his childhood he used to recite Yusuf Zulekha to his mother and while reciting some verses his eyes would fill with tears. Rahi has derived the pathos in his poetry from the condition of the common Punjabi girl who is not treated any better than animals in our feudal setup. Even the girl in his partition poems is a poor common female. It is a pity that during the last few decades, Rahi got engaged in writing scripts and songs for movies. But he gave a literary touch to the songs. His role in improving the standard of Punjabi songs was akin to that of Sahir and Qateel in Urdu songs. Now in his late 70s, Rahi is no longer active in literary or film work. Ill health and some tragedies compounded by pecuniary problems have forced this otherwise lively person into seclusion. Can the Academy of Letters do something for him? The partition of the subcontinent brought in its wake bloody riots that resulted in the biggest human migration. The worst hit was the province of Punjab, which was partitioned on the basis of religion. No wonder that the Punjabis remember the partition with sorrow and anguish -- when they lost thousands of their dear ones and their ancestral abodes. In utter destitution they landed on both sides of the border as refugees -- Muslims in Pakistani Punjab and Hindus and Sikhs in Indian Punjab. Among them were many reputed writers who felt emotionally shattered. While they converged from all over India, quite a large number came from East Punjab. Thus in his autobiography, Intezar Husain talks of a number of writers who came to live in Lahore after partition. The city of Amritsar, not very far from Lahore and being a part of India now, had always boasted a large number of writers and intellectuals who were mostly Muslims. They also came over to Lahore. Soon after finding shelter these writers resumed their literary activity and most of them gathered under the banner of Progressive Writers Association (PWA). Most were young and full of promise. A.Hameed, fiction writer, in his book on Ibne Insha has very beautifully drawn the picture of their first meetings in the Tea House. He describes how he met Ashfaq Ahmad, Ibne Insha, Safdar Mir and others there. Among these writers there was also Ahmad Rahi, a typical Amritsari. A.Hameed once told me that Ahmad Rahi, whose real name is Ghulam Ahmad, was his school fellow. "In Amritsari families, at least one young man was supposed to be a wrestler. My own parents wanted me to be a wrestler," A.Hameed said to me. Ahmad Rahi owed his physical appearance to his quest to become a wrestler at an early stage in his life. But both these friends chose to be writers instead. In Do Mulk Aik Kahani Ibrahim Jalees wrote how these young writers spent those early days after partition, when they were jobless and had nothing else to do, writing and spent days and nights together discussing the problems faced by the Pakistani 'proletariat'. They were totally committed to bringing an equitable social order in the country. And Ibrahim Jalees tells us that when they were in lighter moods, Safdar Mir and Ahmad Rahi would compare the number of push-ups done in their daily routine of exercise. The activity associated with PWA did not last long. The government that had come closer to America came down with a heavy hand on the communists and their fellow travellers. These writers were either hauled up by the state or gave up activism, finding different vocations for themselves. Many of them tried their luck in the fledgling film industry of Pakistan.